5043 EARL OF MOUNT EDGCUMBE – Returning to Cardiff for the first time since December 1963 (March 11th, 7 locations), in blistering form along the Welsh Marches route in beautiful spring weather (March 25th, 6 locations), working to Salisbury via the Southern, including some stunning shots leaving Tyseley and around Fenny Compton, (April 8th, 7 locations), running to Chester via the old Cambrian Coast route (Sept 25th, 6 locations), and working its annual Christmas Special to York (Dec 16th). 60103 FLYING SCOTSMAN – working the Settle & Carlisle re-opening special (March 31st, 3 locations), and also on several specials around Bristol, South Wales (May 23rd, 6 locations), and working a circular tour from the West Somerset Railway to Bath & Bristol via Westbury (May 26th, (6 locations). 35028 CLAN LINE – Featured on the END OF SOUTHERN STEAM tours including the Bournemouth Belle recreation, exactly 50 years ago to the day since the last run, (July 5th,5 locations), The Waterloo Sunset, (July 9th, (6 locations), Golden Arrow, (Sept 13th, 6 locations, including Martin Mill Bank & Folkestone Warren), and the Atlantic Coast Express to Exeter (Sept 23rd, 15 locations including Honiton Bank). 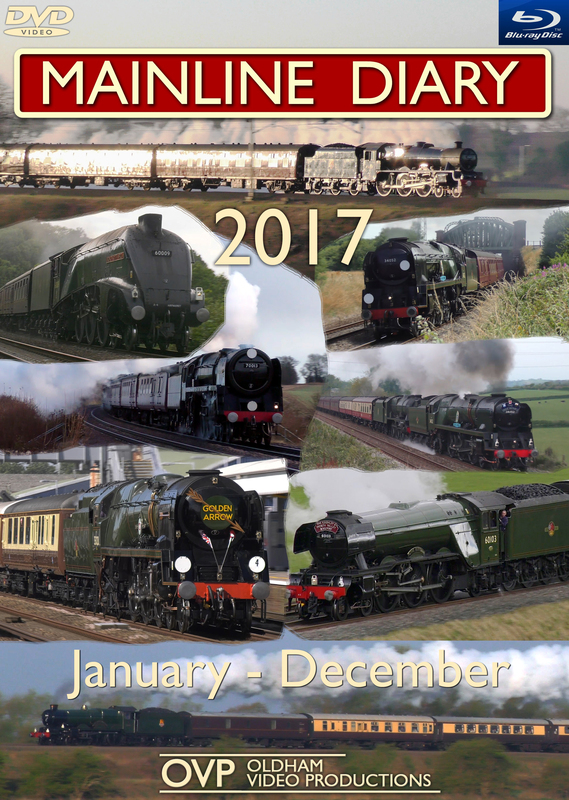 We also feature the locomotive making its debut on the Torbay Express (August 20th, (6 locations, including high-speed chase sequence), with some superb running on all trains featured. 46233 DUCHESS OF SUTHERLAND & 60009 UNION OF SOUTH AFRICA going head to head against each other on specials through the Cotswolds and also on Sapperton Bank (August 17th & 26th).